Today, security is a major concern for enterprises across domains than ever before. Last year, malware-based cyberattacks have led to a sales and revenue loss of almost $300 million by leading global enterprises. In the previous article, we outlined the top security threats that organizations are facing today. 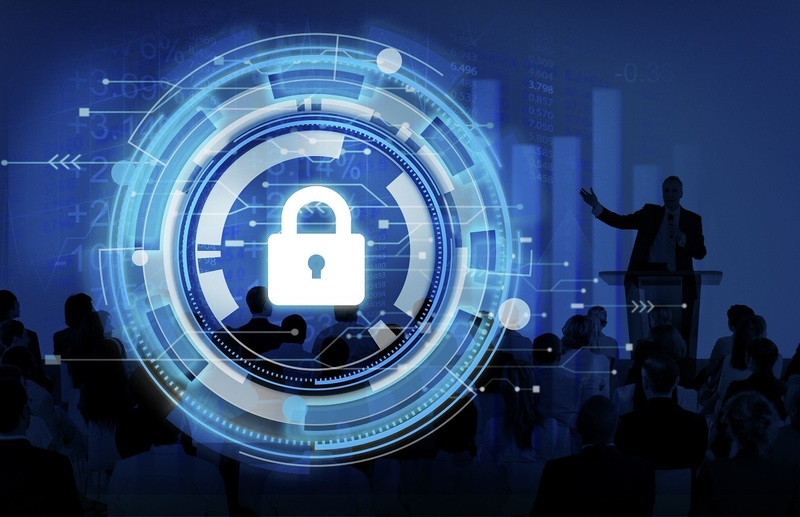 In this article, we will dig a little deeper into the topic of security considerations that enterprises should keep in mind while implementing a digital enterprise solution. Properly analyze the need and pain points that the digital solution will help resolve. If your business can really benefit from an enterprise mobility solution, you can immediately figure it out from the information dissemination flows within the various processes. Unfortunately, this seemingly simple step is often overlooked in the race to stay ahead in the industry. Before developing any digital solution, you need to ensure that you have a solid software architecture that is scalable and resilient. Having a robust software architecture exemplifies several important attributes like performance, quality, scalability, maintainability, manageability, and usability. Making scalability and resilience an integral part of the development will allow the app to sync up with the changing business requirements and the evolving risk landscape. It can also save you from bad customer relations, cost overruns because of the redesign, and revenue loss. Try not to impose solutions on your frontline staff. Instead, understand how the business will leverage it. Investing in an enterprise mobility solution without completely understanding its usage can leave open gaps in the system and leave the staff clueless about its functions and utility. Therefore, an in-depth understanding of the day-to-day operational activities and how these solutions will enhance routine tasks is crucial while selecting the solution. The same effort that you would invest in product conceptualizing and development should be put into testing and quality control for your digital solutions. App testing is paramount if you want your software to perform well. Ask your team to test the application so that there are no loopholes identified during its usage. Needless to say, you would want to ensure that your app performs well to give an enhanced user experience. Data management on devices is critical for the security of the app and goes beyond locking down the devices. The device data should be encrypted, protected with a password, time-bombed, and even remote-wiped. Some of the other ways to protect data are by granting/denying permission to store a file and building security for data flow. A huge roadblock for the organizations is the inertia towards adopting the technology itself. Most teams set in the traditional operations are often unwilling to shift to a new style of working. The only way out of it is to test the solution on a small set of employees and see how the product works. It is all about gaining the trust of a few people who can then become natural influencers of the product. Going big-bang with any new technology can backfire and is naturally not a good idea. The cloud has provided organizations with a completely new frontier for data storage and access, flexibility, and productivity. But with all this comes a world of security concerns. Ensuring that you follow the best of cloud security can avoid data breaches and malware attacks and keep your organization’s integrity and reputation intact. 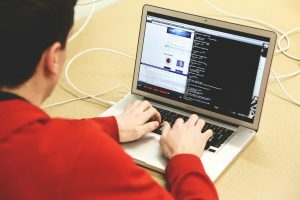 Reviewing source code for vulnerabilities and security loopholes is an important part of the software development process. Second, it protects the organization and its clients from attempted attacks on the company’s digital solutions. Use a strong security check over source code by limiting access, auditing the source code periodically and reviewing the codes independently. Packet filtering: analyzing and distributing a small amount of data based on the filter’s standards. Proxy service: saving online information and sending to the requesting system. Stateful inspection: matching specific details of a data packet with a reliable database. Certificate underpinning means using an SSL certificate to verify users. An SSL certificate links an organization’s details with an encrypted key to allow users to connect securely to the application’s servers. There are several organizations that do not use certificate underpinning, which makes them susceptible to cyber attacks. Needless to say, having weak security measures is as good as having no security standards. Organizations are always advised to use strong passwords and change them frequently to avoid security breaches. Using end-to-end encryption ensures that user data is secured and is at the least risk of being compromised or jeopardized. Another security aspect of digital enterprise solutions is the existence of impersonating solutions. These impersonating solutions are malware that creates almost a replica of legitimate copies to fool users into downloading them. Once downloaded, this fictitious software can harm the system in several ways, from remotely accessing devices and stealing information to bombarding users with pop-ups and advertisements. In any case, whenever an organization’s security is compromised, it is always the user’s data that is at the risk of being exploited. Once you’ve created an in-house app, the challenge will be in distributing it. Enterprise apps can either be distributed in-house or can be provided through various operating systems. However, the job is not as easy as it sounds. While a private app is not intended for distribution through an App Store, there are several ways they can be distributed outside it, including iOS app ad hoc, through Xcode or Apple Configurator 2. You can also sign up for Apple’s Enterprise Deployment Program for app distribution. Cybersecurity has to be one of the priorities of organizations when developing enterprise digital solutions. But with this, you need to understand how to test your solution’s security to safeguard your organization. 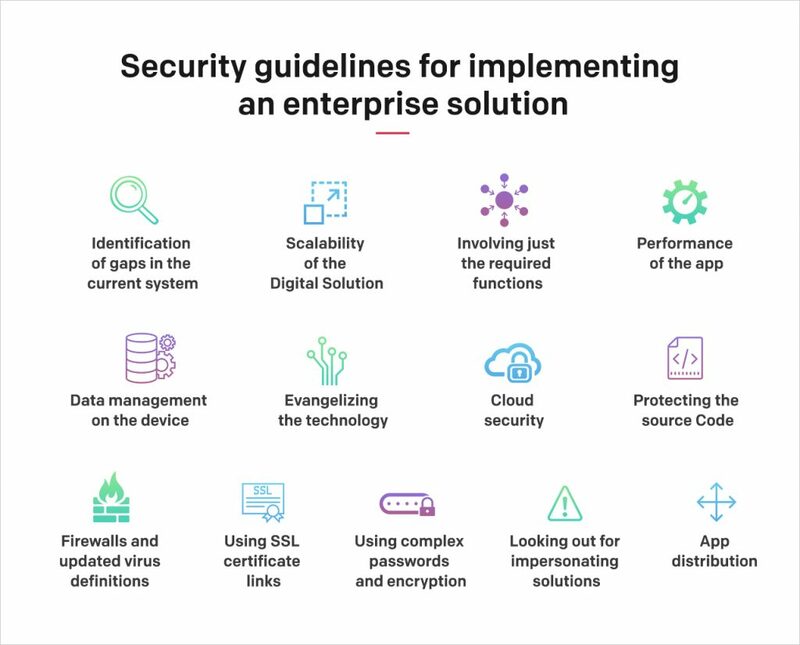 The security considerations mentioned above are not necessarily the only thing to keep in mind while developing the solutions, but they are definitely a good place, to begin with. After all, if your business isn’t already digital, it soon will be. To prepare for that, you need to offer the most secure digital experiences to your clients, employees, and business partners, irrespective of their location or the devices they use.